Visiting South Korea is a good choice for you who want to have a comfortable and beautiful nuance during your holiday. This K-pop country offers you clean environments and million of natural beauties. Besides, the tasty traditional and typical Korean foods make many tourists interested to visit South Korea. So, what are those foods that you should try when you visit South Korea? Jokbal is boiled and salted pig legs. When it is served, Jokbal is already ovally cut. Jokbal is cooked with leeks, gingers, garlic, and rice wine. This menu is usually served in a big portion. One portion can be eaten by 4 persons. This menu is served with a bowl of rice and side dishes such as kimchi and soup. Dwaeji means pork and Gukbap means rice with broth. This food is very typical because of its delicious smell and it is suitable for lunch and dinner. Korean people usually mix rice directly with the pork soup. Dwaeji Gukbap is best served when it is hot. Kimchi Jigae is a menu in the form of a bowl of spicy soup boiled with kimchi. Various food ingredients are also put into this spicy soup, such as tofu, meats, leeks, seafood, and many others. Jjampong is noodles mixed with seafood, vegetables, and meats. This menu has a spicy and savory taste. Jjampong is similar to Ramyun. But what makes it different with Ramyun is that Jjampong has a lot of seafood including clams. For you who love seafood, you must try this menu when you visit South Korea. 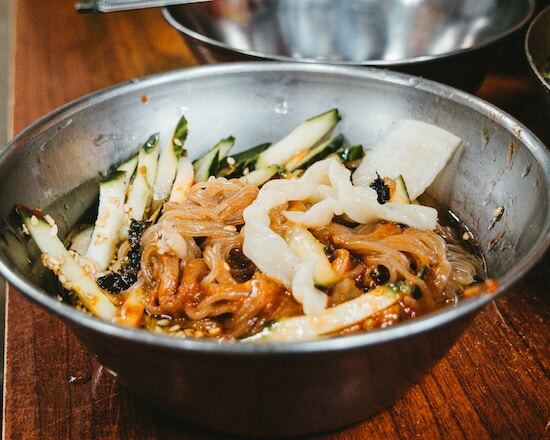 This one typical Korean food is the favorite of many tourists who have visited South Korea. Samgyeopsal is pieces of porks which are roasted in a pan. When you eat this menu, try to eat it like locals. Wrap the pork in lettuce, add spicy paste, garlic, and eat it. You will be able to taste various delicious taste in your mouth. A portion of this menu is usually eaten by several persons. So that it is not rare that many restaurants in South Korea serve Samgyeopsal as all you can eat menu. Jjajangmyeon is noodles covered with a black sauce that is made from black bean paste. Jjajangmyeon is a must-taste menu when you visit South Korea because this menu is pretty affordable and easy to find. You are also able to make a delivery to your hotel. Sundubu Jigae is a soup made from soft tofu, meats, and onions cooked in a beef broth. This soup is served with kimchi and very suitable during winter. Sundubu Jigae has a quite spicy taste. Gimbab is so popular around the world. This menu is most commonly found in South Korea. You do not need to go to a restaurant, you can find Gimbab even in convenience stores. The price is also affordable. Gimbab is made from rice wrapped in seaweed and filled with cucumbers, tuna, meats, eggs, and other food ingredients. Make sure you try this menu when you are visiting South Korea.